I love to bring new trends to you every January! It’s sort of like my state of the decorating world report! Let’s have fun with today’s post! classics are always in style! Because something is trending means that right now it is the hot item. 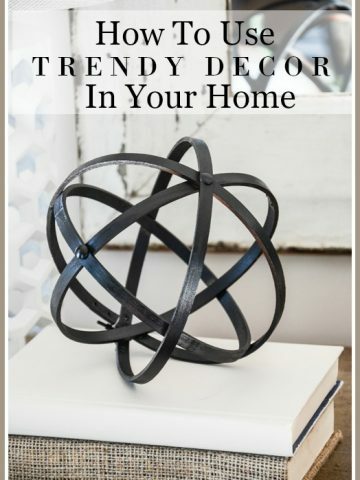 What it does not mean is that home decor not trending is out of style. There are many recent trends like marble, neutral color palettes, real brass, white kitchens, greige, etc that will remain relevant and always beautiful. They have become classics. See our master bedroom headboard here. These have been in and out and now back in. There is a trend for more luxury, more layers, more… well more this year! Beautiful, sumptuous headboards are a classic in my book! My opinion… Yea!!!! I think bedrooms should be sanctuaries! And a padded headboard goes a long way to make a bedroom looks plush! I have two padded headboards in my home. It took me awhile to get on the bandwagon but I LOVE them! See my headboards here and here. See this beautiful bed here. 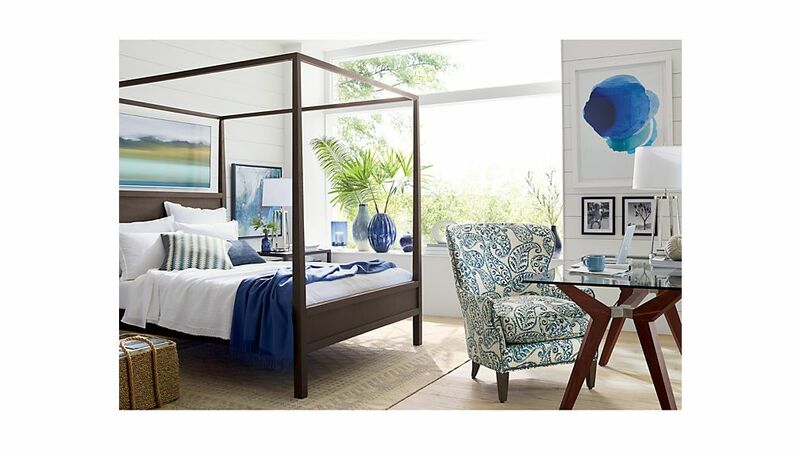 Let’s all give a cheer for the beauty of four poster beds coming back in style! Today’s poster beds are less fussy and more sleek in their updated styling. My opinion… yes, yes, yes! If you have the room in a bedroom opt for a four poster bed. Cozy and layered bedrooms are back and they should be! This is one room that should feel luxurious! See my dream sofa here. Every year I see this on the list of new hot trends. I think this is wishful thinking on the part of the decorating industry! However, I am seeing gorgeous rich colors like navy and organic greens and spicy paprika seeping into decor. I think the design world is aching for a little more color in our decor lives! 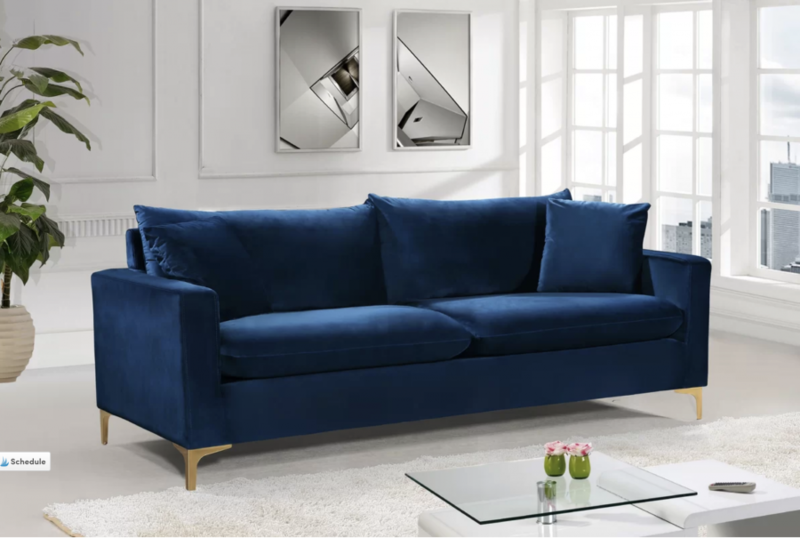 My opinion… I’d LOVE a navy velvet sofa in my living or family room but I’m not that daring and would probably get bored of it. If I am using rich colors this year I’ll use them in pillows. A navy velvet pillow sounds divine! Gorgeous updated floral! See it here. I’m seeing the influence of this almost everywhere. Florals are on the horizon. We really have not seen a resurgence like this since the days of cabbage roses and big floral wallpaper. Look for florals done in interesting new and stylized ways! My opinion… Floral wallpaper will be big in magazines and in the designer world. However, I don’t see this trend making its way to the everyday home decorator. We are still recovering from all the scraping and steaming to get our old floral wallpaper off our walls! Many of us have vowed never to put up flowered wallpaper again! Floral accents are the way to go if you want a bit of flowery design in your home! I love the idea of floral bedding! I have a stylized floral chair and love it! See it here. Peel and stick wallpaper that makes me want to paper a room with it. Since we are talking about it, wallpaper is still on trend! If you love wallpaper you might want to try repositional or peel and stick wallpaper. It is easy to put up and comes down easily too! My opinion… yes we might be ready for a little wallpaper. The trend is not an accent wall, that is so last decade (LOL!) but wallpapering a whole room. I’ve done the floral room before and probably won’t do it again! 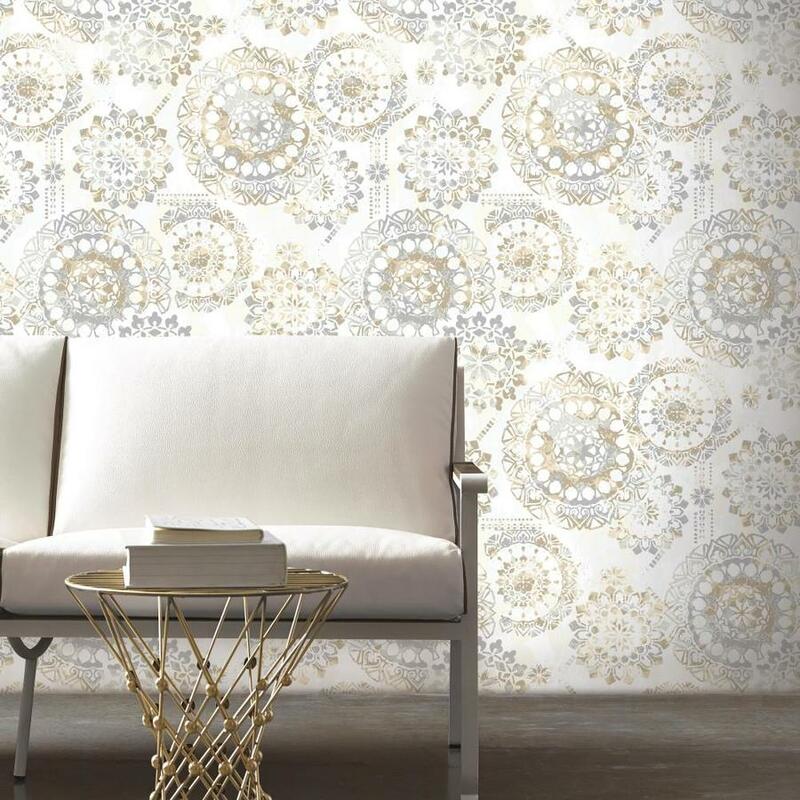 I adore repositional wallpaper and will use it on a long wall in the upstairs hallways this winter, ignoring the trend. The wallpaper above is peel and stick and I would certainly do a room in it! It makes me weak in the knees! I don’t feel this is a new trend but I’m still seeing lots of white or neutral decor. Personally, I love this style because I love white and neutrals. A pop of color can be a breath of fresh air to decor! Choose to use color by adding colorful accents to your decor. My opinion… I am seeing one big statement piece in a bold color (like a navy velvet sofa, sigh) and then lots of whites and neutrals. I love this look but it is quite a gamble to invest in a statement piece that you might get tired of after a year or two. This is really a classic combination done in a fresh way. Lots of white with a little bit of black mixed in. This timeless look is a balancing act! Get it right and it will work for years and years! Get the contrast wrong and it will look contrived! My opinion…Black and white decor will be around for a long time! It is a classic! For this look, you must totally embrace it! Be willing to be bold or leave this look alone! 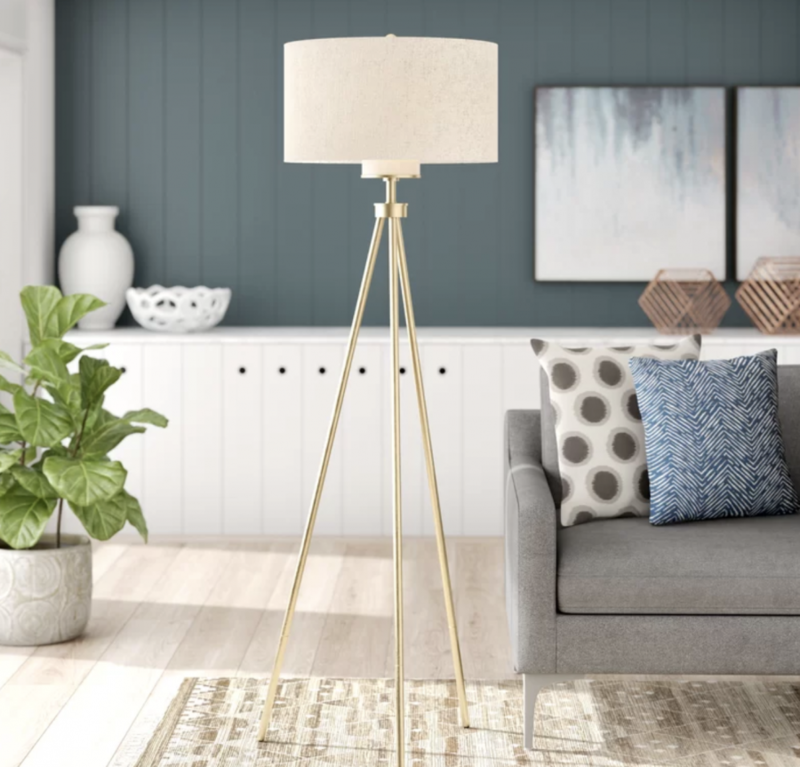 See my choice in a floor lamp here. Brass is always a classic but what makes it hot again in 2019 is brass is showing up in its warm unlacquered state so over time it obtains a gorgeous patina that is swoon worthy! There is a big, big movement away from stainless steel accents to the warmth of brass and gold. 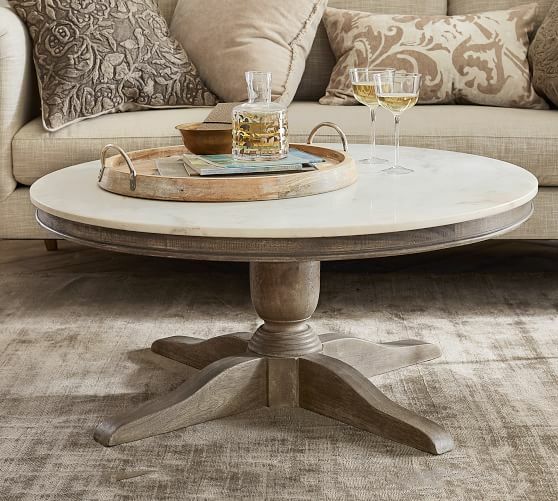 Gold accents are brushed and have a muted down elegance. But don’t overdo it! Too much of a good thing is not good. Mixing metals is will always be in style and the right way to decorate! My opinion… I love brass and goldtone metal but I mix them with other metals. Brass is a very bold metal and too much brass can be overpowering. I’m opting to add brass and mix it with other metals. See the glass and goldtone end tables I’m using as nightstands in my master bedroom here. And see the over-the-top gold armiore I love, love, love in the master bedroom here. Cool tones and gray have dominated the decor scene for awhile now. Move over gray you are being edged out by warm neutrals and cozier colors in warmer tones. My opinion…Personally I am thrilled to see this trend. For me, too much gray comes across flat and sad! I saw neutrals coming on stron last year but this year warm neutrals are huge! Can you see me doing the “happy dance of joy”? Saying that, I love a little mix of gray with my neutrals. See my neutral color bar stools here. And my guest room bedding here and here. See the barrel chair in my bedroom here. See the rug in my family room here. Just sayin’ I LOVE the new rug in my family room! There will always be a market for vintage items and antiques but over the last few years they have fallen on bad times. Now we are seeing them show up again in a new and fresh way. Many fabulous decorators use vintage and antique pieces to create a curated look. My opinion… I’m not much of a vintage or antique girl but I love the idea of adding something antique for a curated look. I’ll be adding this trend to StoneGable in 2019. Animal prints were out in 2018 and now they are back in. Especially when it comes to rugs. Not only animal prints but animal shapes. My opinion… I think animal prints have stood the test of time and are an all-star classic! 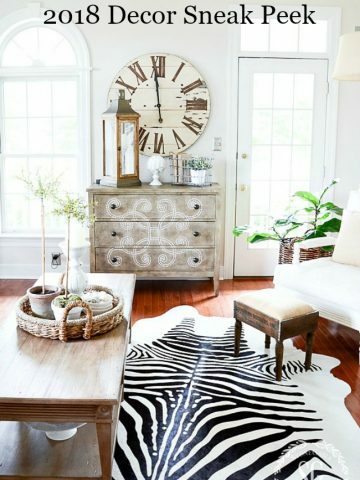 You will be seeing an animal print rug (not just the zebra pelt) on my floor in 2019! Very bold, but I love this look! Also, keep your animal print pillows etc. A bit of the wild in a room makes it look fun and exciting. Today we are much more eco-friendly and aware of what is good and harmful to our planet. Sustainability in home decor means knowing what materials are in the things put in our homes and how they effect the planet. Think about using and updating furniture that is already around. Too many nice home decor items are filling up our landfills! 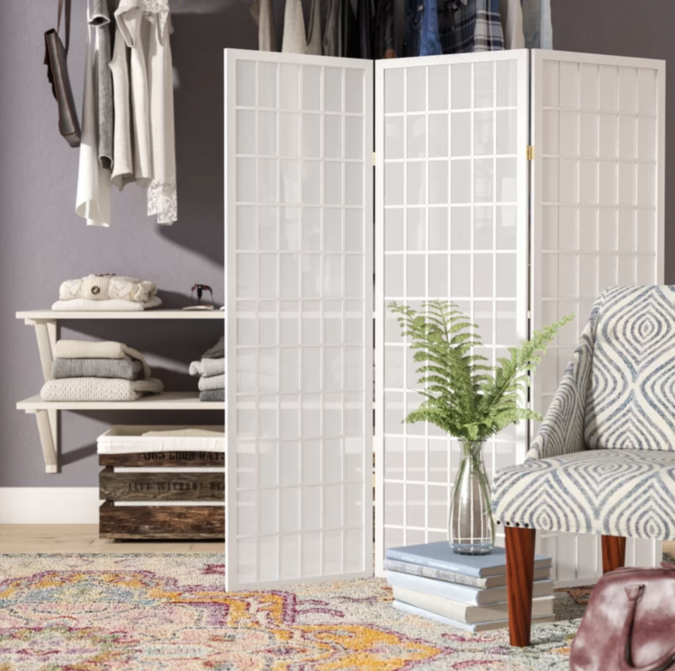 The home furnishing industry is moving to more sustainable materials. Good for them and us too! My opinion… this is certainly a good thing! Say it ain’t so! Just because the decor industry says these are not hot and trendy does not mean you still can’t love them and decorate with them! Or like the decor industry, you might be tired of them too! Here’s the great news, YOU get to decide! Just don’t shoot the messenger, please! So now you know! Enjoy decor trends but use what you love! love all these ideas of what’s in and what’s out. decorating a new home for the first time in 49 yrs and these are a huge help. i have decided to do my guest bath in a black and white theme and had actually picked the black and white rug you show. then i saw the animal print rugs and was like wow! would it look ok to put an animal print rug like the leopard on the floor even though it is not b&w. would it be a wow factor or over kill. would love to get it right like you said thanks! I love lots of decorative pillows on the bed. However, they are taken off at night to sleep and put on the floor which looks so messy. Any suggestions? I enjoyed your last post on the trends. Thanks. I put the pillows from my bed onto my settee. Or how about using a big basket on the floor that will hold all those pillows. Where did you get the lamp on your Desk? Hi Becky, I found this years ago on Hayneedle. Check to see if they still have it. Hi Teri, I found it at Wayfair. Next week I’ll be sharing sources for my family room. I guess maybe I’m a little ahead of the curve for a change. We live in a very small, 1500sq ft home. We are about to repaint the inside of our home. I am going with a soft white, but most of our furnishings are neutral. I am using a white/navy floral for drapes in our main living space and use navy accents that can be easily changed out. I love texture so pillows and accessories, along with some antique, family pieces will be added. I mix metals although mercury glass is my current passion. Living in north Texas, just about anything goes here. But nice to see that I’m on the right track. Thank you Yvonne for your sense of style and great advice! Yes Yvonne, I just purchased a navy sofa and double chair & ottoman from Crate & Barrel. I live on the water so I decorate a little differently. However, I so love your style thank you once again. The bedroom is lovely and has given me several ideas. I am interested in the brass wall mounted lamps. Would you please tell me where to purchase them? 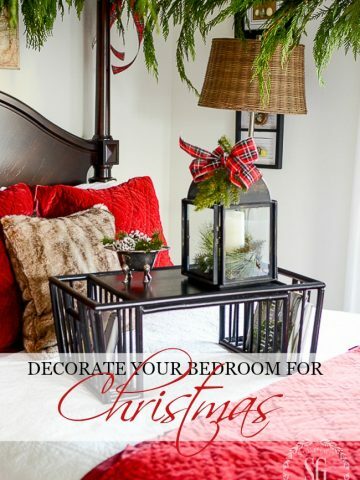 Please share where to find the burlap bedskirt. Just what I am looking for. Hi Rainy, it is raw silk. I found it at Soft Surroundings online. Hope this helps. The loveliest idea in this post is forgetting the trend if you don’t LOVE it. Either fortunately or unfortunately I’ve lived through a lot of trends, but I’m still loving the same home going on 30 years. You are right on when you say the biggest investments are classic. This will be the third time I pack and store that hand carved vintage cow but I’m still sitting on that Baker sofa. Uplifting post! what color/brand is the paint in this room…wall and trim. Gorgeous! I am no longer about Trends – This year, with a loss of a grandchild that didn’t make it into this world, my new motto is BE HAPPY WITH WHAT YOU HAVE! I love your blog and that you stay true to what you love. For me this year – Trends can take a hike – I will personally fill my home with all the job a family brings no matter if the item is trending or not! FAMILY FIRST PEOPLE WE DON’T LIVE IN MODEL HOMES – LIVE – YOU NEVER KNOW GODS PLAN. Oh Linda! I am so so sorry! God bless you and your family! I prayed for all of you and asked God to bring you to mind so I can pray for you throughout the day. My heart aches for your loss! A brilliant blog post with a sharp perspective to creating a meaningful home. Thank you for such great content ; decorating is less stressful with your keen eye. I am particularly interested in the “picnic” style table with the fold over table top that is shown in your inspiration photo. It is truely a wonderful piece with great function. Would you care to share the source for this table? Thank you in advance. Very interesting and I appreciate your insight on the trends. You could not pay me enough to hang wallpaper in my house! The only way I rid myself of it was to move to a new house and leave it behind! I especially dislike the border papers! But I am happy to see neutrals are the mainstay of happy design and they should be. I agree with you, a neutral palette can be modified so easily with pillows, rugs, and art. 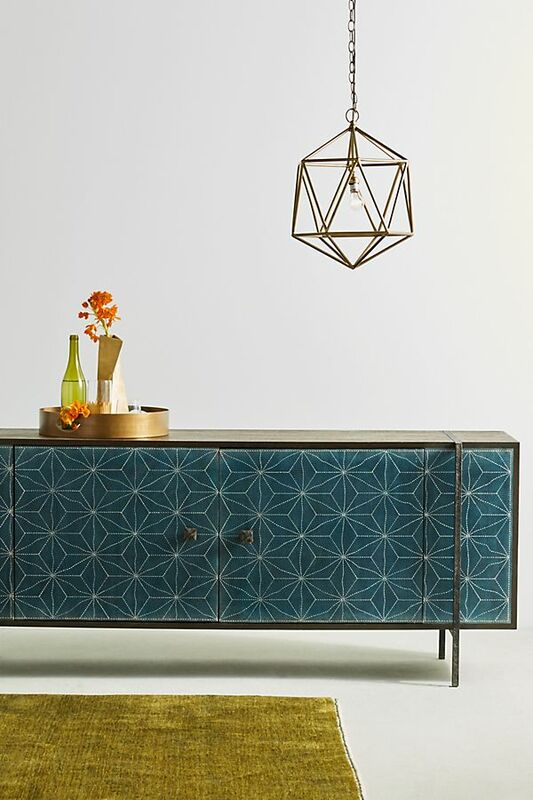 I see a lot of the mid-century modern furniture in shops and really think it is hideous—glad to see it going away! Great information, thanks! I’m not a person who goes for trends, but I am on board with almost all of these trends. I am a color gal and so glad to see gray finally on the way out. I love antiques for the French look, and color feeds my soul. I am really happy to hear antiques are returning and that worded signs are slowing down. I love worded signs for seasonal decor, but it’s losing its sheen. My tastes run to classics and boring loveable white. Thank you for the info, noted! I love neutrals with a bit of gray.I am slowly trying to get my home to that point.Always a work in progress ! I love your attitude Doreen! Oh, YES! What a brilliant and BEAUTIFUL idea Marian. Thanks! Unfotunately I’ve been living under a rock for the past 10 years and then found Pinterest, then a few blogs, and I’m still not even on Instagram!! I just bought a ton of farmhouse decor, that I now have to try and sell. Plus I discovered I’m more of a French country, transitional, traditional kinda gal, lol!!! Ohhhhh at the money I’ve just totally wasted! I just know that I have champagne taste on a beer budget. I’ve GOT to find my style soon before I’m completely broke! At least I have a color pallet picked out, that’s a start, right? Right. Thanks for that enlightening post. Wish me luck! I just love seeing little glimpses into your home. It’s so warm and comfortable feeling. It makes me want to grab a book and a throw and one of your beautiful pillows and linger for an afternoon. The rooms looks so inviting and calming. Thank you for sharing these windows into you. They give me so many ideas. I like what I see coming in for 2019. I am terribly tired of the same old, same old. I totally agree with your list of what’s going out. Goodbye macrame, lol. I’m so glad gray is on it’s way out. It’s been so overdone. I’ve never been a fan of all white rooms, walls, window coverings, furniture, etc. Where is the design there? Give me warmth again. Yay! I love reading about trends but I don’t necessarily follow them. I love neutrals in my home. It is my sanctuary. 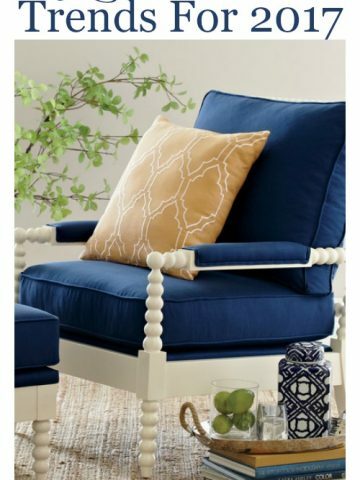 So, while I read about the latest color, I don’t change my home to incorporate them unless in toss cushions. That I do have fun with! 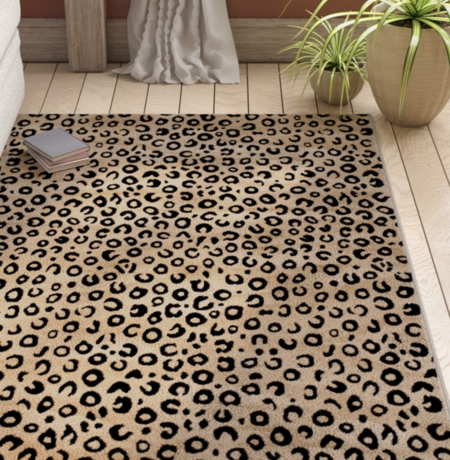 I’m seriously consider an animal print rug for my living room. Now, to get my husband onboard. I just want to follow you around when you go pillow shopping, and then put everything in my cart that I see you buy! LOL! YOU ARE ADORABLE, Marie! So nice to see you comment! Thank you for your words of caution about using trends, I just looked at a great bones home on the market yesterday. Unfortunately, every room was a different display of some trend….shiplap, wallpaper, faux painting, tile, barnwood, venetian plaster, etc. No flow between rooms, and expensive to fix. See why has been on market a long time….. Thank you for this! It is very helpful and I love your comments about each trend. I am happy to hear the color trend moving away from gray as I just finished a complete kitchen and living area remodel by taking down a wall between them and I did all warm neutrals rather than gray. I didn’t do what everyone else did because I absolutely LOVE the browns, tans, creams, whites and even updated taupes. I am loving the ability to decorate red accents for Christmas and now fresh winter blues until spring.I will be able to change out for every season and holiday with the neutral foundation that makes my heart skip a beat! Your posts and gorgeous home is such an inspiration to me. Thank you!! Hi Sue, your new kitchen and living area sounds wonderful! Doesn’t a makeover breathe new life into a home? Thanks for sharing about your home with all of us. And thanks so much for your nice compliment! Upholstery headboards are lovely but I always think they would be too much trouble keeping them clean. Is this really a problem? I worried a little about that too. But they are not a problem. I vacuum them to keep them free of dust. And they are so reasonable in price I can have it for a few years and replace it! Hello! While I’ve never been a particularly strong trend follower, I must say that copper is more of a classic than trend decor. It is very expensive and therefore, an investment. Don’t let someone tell you to stick classics like copper away in the garage. If you love copper and own it, let it have a permanent home in your house. Hide it away when you yourself get tired of it, not when someone else tells you it’s no longer “in”. I can see you love copper Valerie! We should use what we love! I have read the trends reports every year and they seem to all come back to using trends in small doses. 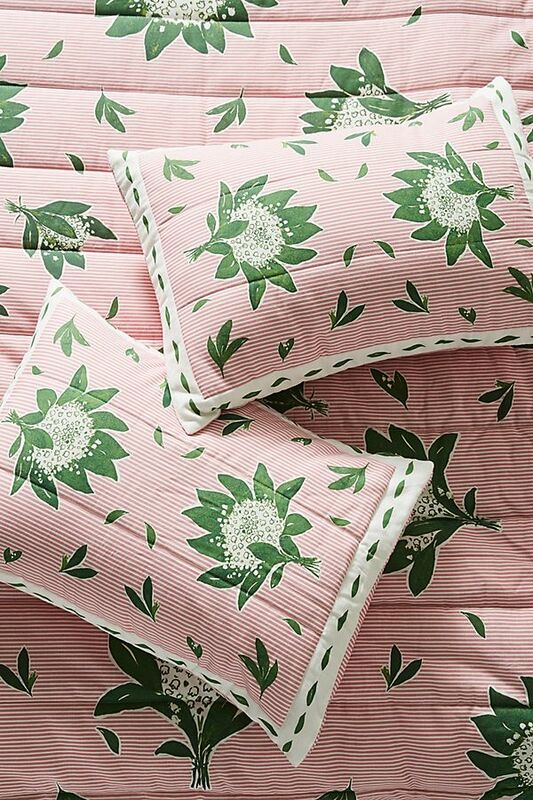 I love the classics with pops of trendy colors and patterns on pillows too. Love your suggestion about florals on the wall. Love florals? Put them in a frame! I have seen a magnificent wallpaper design. But thinking maybe having a faux painter duplicate it. So when I tire of it you just paint over it. ?. Have a great day Yvonne! Oh! I saw that PB coffee table. It’s beautiful but one drawback is the marble top. I would be obsessing over “spills” ? unless there is this great sealant out there. Great idea about putting wallpaper in a frame! So glad to hear that warm neutrals will be on trend. My home is mainly warm neutrals with just a few gray accents and that has always been my preference. I had no intention of changing, but I am glad to hear that maybe I won’t be looking dated anytime soon. 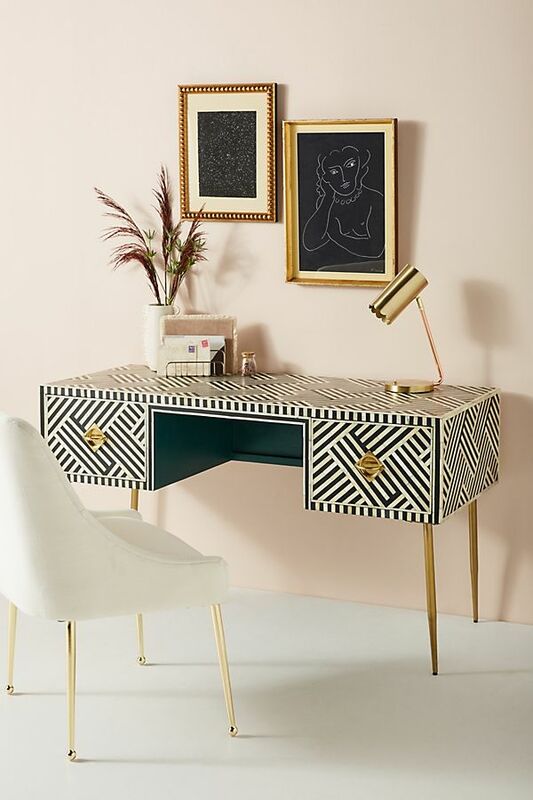 I am in LOVE with the wallpaper you show with the chair and gold accent table but the link below it is actually for the florals from Anthropology. Can you post the correct link for the wallpaper please? Thank you! Sorry, I get so frustrated about broken links! Whats in is now out and soon we will call them antiques and they will be in again. Thanks for the 2019 update in decor. I am going to take some of this to heart. I will keep what I love and update in some rooms. There is always so much to consider when redoing a room. Very insightful blog post. The opening paragraph reached out to me in your sentence, ‘It’s fun to see what “the experts” say is in and out for the year.’. I kept thinking throughout the article, just who are these experts and how do they relate to me as I live in a very modest home on the edge of East Texas and I loved when you included a bullet of ‘*have fun with trends but know your decorating style’. Some of these ‘trends’ are not for me because I don’t comprehend changing hardware in my home for a current trend, such as changing faucets to brass simply because someone says that is what is current. I have never been one to keep up with the Jones’ but I do find it interesting how often the blog world updates their home decorating and understand that that blog post is their ‘job’, it is how they are making money. Again, a very intuitive posts and I adore your decorating style. Not all trends are for all home decorators. I think we all need to have a little look and a little fun with it. Mixing white and creams along with other neutrals and lots of texture make for a very pretty and interesting room. If everything was just one color it would look flat and boring! Go ahead and mix, my friend! Thank you for realizing that! I was hoping my readers would love to see what IN for 2019 and have some fun with it! Love this article – you are always so insightful and have such beautiful classic style! I learn so much every time ! I especially appreciate the tip of just because it’s not on trend doesn’t mean you can’t use and keep what you love and mix in small bursts of a trend! ?